The 23rd Health Care Compliance Association (HCCA) Compliance Institute gathered more than 3,000 healthcare compliance professionals in Boston, Massachusetts last week. The Compliance Institute offers the opportunity to learn about the latest developments and priorities from regulators, and this year’s event was no exception. 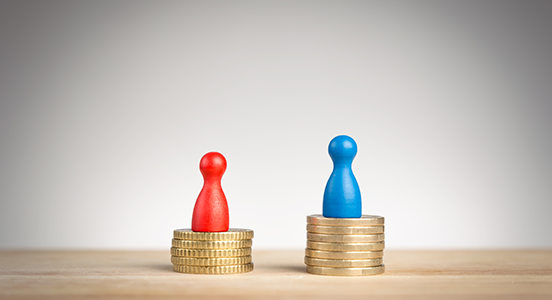 Despite the challenges from working in a highly regulated industry, there are many opportunities for compliance officers to strengthen their healthcare organization’s compliance program. 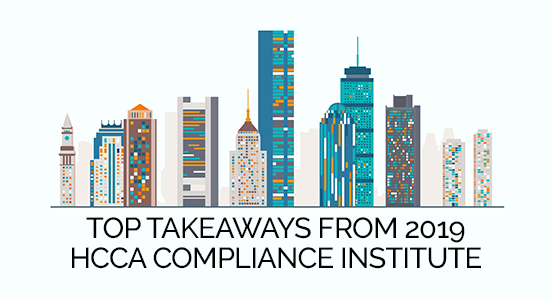 The following represent my top takeaways from HCCA’s 2019 Compliance Institute. Patients Over Paperwork Program: This signature initiative centers around putting patients first. Providers spend too much time on paperwork and not enough time with patients. With the planned changes from 2018 through 2021, this project is expected to reduce more than 40 million hours of regulatory burden and save health systems an estimated $5.7 billion. Simplifying Documentation Requirements: CMS has made a number of changes to simplify documentation requirements using a two-prong approach. First, the provider documentation checklist centralized all documentation requirements in one place. Second, the agency offers a provider documentation lookup service. Forthcoming Stark Law Updates: The Stark Law was a primary theme of comments submitted in response to CMS’s request for information on burden reduction from 2017. As a result, the agency is working on an update to Stark regulations to be issued later in 2019. MyHealthEData: With patient information trapped in siloed health systems, MyHealthEData is an administration-wide initiative to unleash data to empower patients by giving them control of their healthcare information and allowing it to follow them throughout their journey. Agility and Adaptability: Being nimble and being able to adapt to change is critical. OIG has built a multidisciplinary workforce armed with data and technology to identify program vulnerabilities. 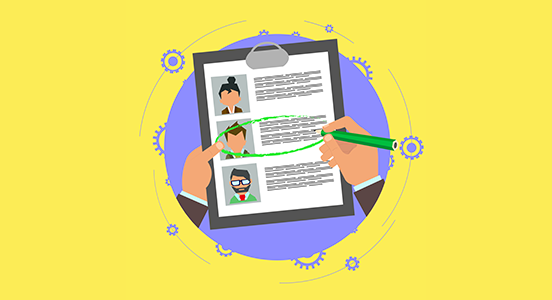 Consider reviewing your staffing plan and be sure you have the right mix of experts. Continuous Prioritization: To respond to rapid change, this involves scanning the environment early and often to look at the current state of play and at the horizon for surfacing issues. As a best practice, support a culture that allows for experimentation. Additionally, setup a regular process for environment scanning and prioritization of your compliance activities and priorities. Compliance Leadership: Be passionate. Leaders disseminate a simple vision about their values and priorities. “For OIG, it’s critical that we do this right, that we do the right things, that we show people we care, and that we support them,” Chiedi explains. As a tip, she suggests seeking a meeting with the people planning your data and technology functions (e.g., chief technology officer, chief innovation officer). Strategic Partnerships: Partnerships are more important than ever in today’s world. “It’s not healthy and sustainable to go at it alone,” Chiedi said. To develop better partnerships, she suggests identifying your organization’s patterns and reaching out to their compliance officers. “Get to the department heads within your organization and start with IT,” she said. One part of an effective compliance and ethics program is that the organization promotes an organizational culture that encourages ethical conduct and a commitment to compliance with the law. “Compliance is not effective without culture,” according to speakers Scott Gima and Margaret Scavotto from Management Performance Associates during a breakout session on compliance culture case studies. “Some people are wired to call and report, but for the people on the fence, your culture will make a difference,” Scavotto explained. Gima defines culture as doing things right. “Compliance needs to be part of the conversation at every level of the organization,” he explained. “It has to start with the C-suite. Involve the board, managers and supervisors to buy in. And you have to reinforce that things have to be done the right way.” The focus should be on taking care of patients, with everything else coming secondary. While Section 1128 of the Social Security Act grants the OIG the authority to exclude individuals and entities from federal healthcare programs, there’s much more to exclusion screening compliance beyond the OIG. “The OIG Special Advisory Bulletin from 2013 is my ‘Exclusions Bible’,” Carey Cothran, Chief Privacy Officer at Piedmont Healthcare, stated during an exclusions breakout session. 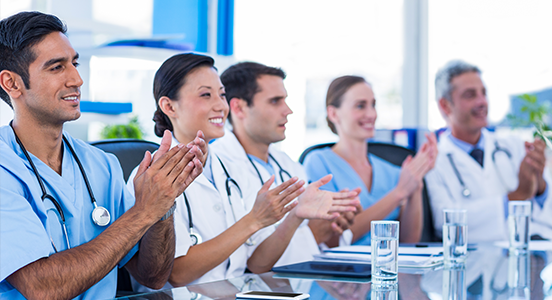 As we approach the next decade, one thing is for certain: the role that compliance officers play in the healthcare system will be critical to ensuring patient care and safety for years to come. Did you attend the HCCA 2019 Compliance Institute? What were your top takeaways? Let us know in the comments section below.